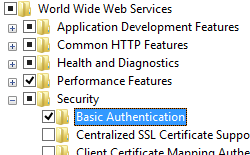 The <basicAuthentication> element contains configuration settings for the Internet Information Services (IIS) 7 Basic authentication module. You configure this element to enable or disable Basic authentication, identify the realm and default logon domain, and determine the logon method the module uses. The Basic authentication scheme is a widely used, industry-standard method for collecting user name and password information. Basic authentication transmits user names and passwords across the network in an unencrypted form. You can use SSL encryption in combination with Basic authentication to help secure user account information transmitted across the Internet or a corporate network. 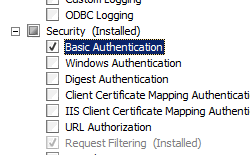 IIS 10.0 The <basicAuthentication> element was not modified in IIS 10.0. IIS 8.5 The <basicAuthentication> element was not modified in IIS 8.5. 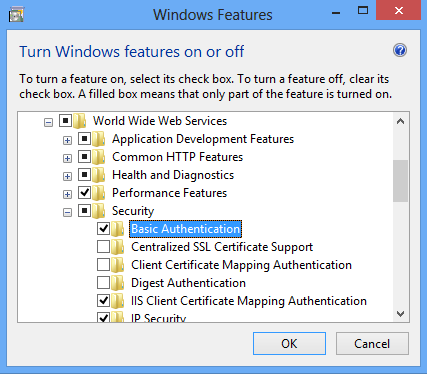 IIS 8.0 The <basicAuthentication> element was not modified in IIS 8.0. 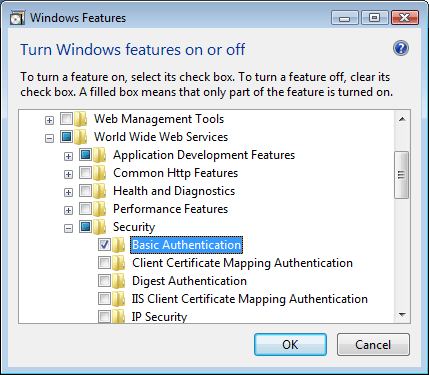 IIS 7.5 The <basicAuthentication> element was not modified in IIS 7.5. 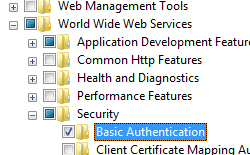 IIS 7.0 The <basicAuthentication> element was introduced in IIS 7.0. 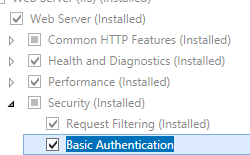 IIS 6.0 The <basicAuthentication> element replaces portions of the IIS 6.0 AuthType and AuthFlags metabase properties. 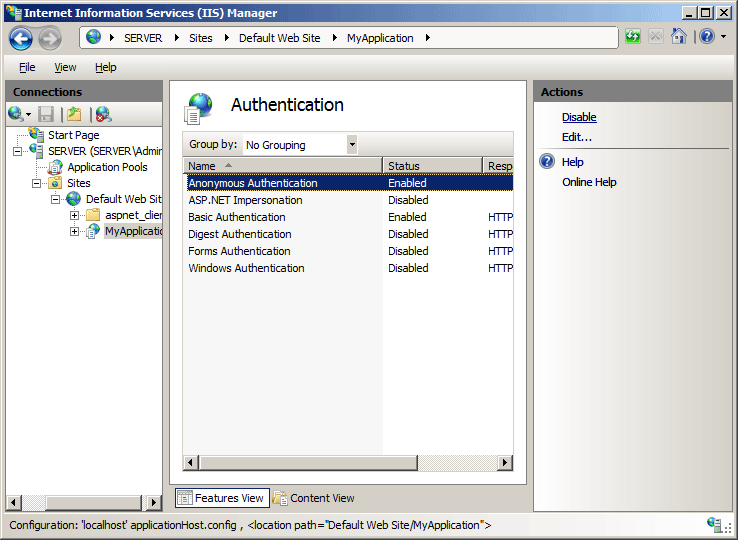 The default installation of IIS 7 and later does not include the Basic authentication role service. 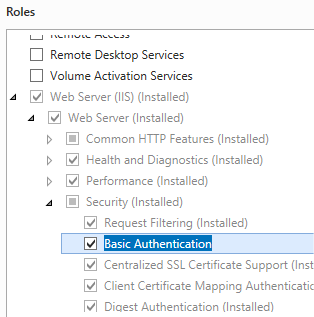 To use Basic authentication on Internet Information Services (IIS), you must install the role service, disable Anonymous authentication for your Web site or application, and then enable Basic authentication for the site or application. To install the Basic authentication role service, use the following steps. On the Server Roles page, expand Web Server (IIS), expand Web Server, expand Security, and then select Basic Authentication. Click Next. Expand Internet Information Services, expand World Wide Web Services, expand Security, and then select Basic Authentication. 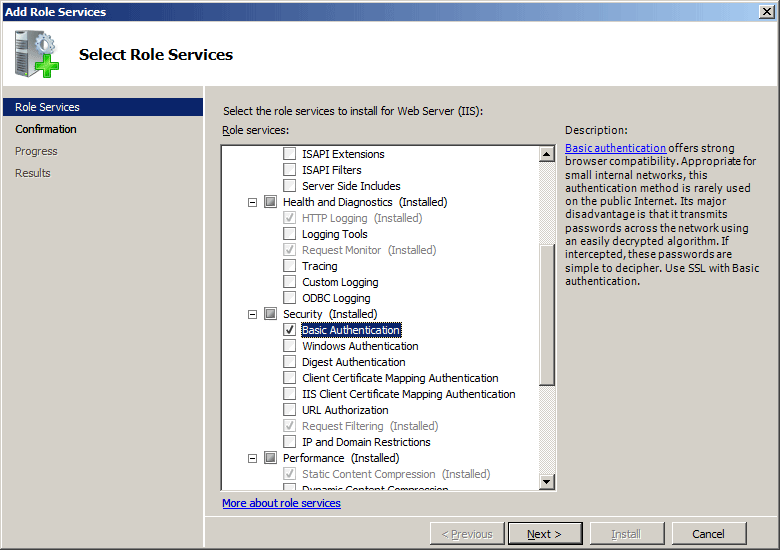 On the Select Role Services page of the Add Role Services Wizard, select Basic Authentication, and then click Next. Expand Internet Information Services, expand World Wide Web Services, expand Security, select Basic Authentication, and then click OK. The <basicAuthentication> element is configurable at the site, application, virtual directory, and URL level. After you install the role service, IIS 7 commits the following configuration settings to the ApplicationHost.config file. Specifies the default logon domain for Basic authentication. Specifies whether Basic authentication is enabled. Specifies the realm for Basic authentication. 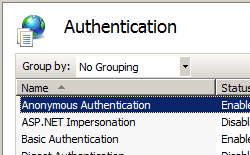 The following configuration sample enables Basic authentication for a Web site, Web application, or Web service. By default these settings must be included in your ApplicationHost.config file, and you must include them in a <location> element and use the path attribute to define the Web site or application where you want to apply the authentication settings. The following examples enable Basic authentication for a site.